Definition: The FT identifies the unconscious by studying the creative process as a natural science conflict resolution or moral order phenomenon. Conflict is generated upon any normative deviation; resolutions offset conflicts through spontaneous and also through deliberate power management changes in the context of normative behaviors. Method: The FT introduces the unconscious as a circumscribed periodic six-role state entity that spontaneously restructures relations reducing chaos and increasing order. This entity abides by the physics of the pendulum oscillation and the laws of the equilibrial scale. This formulation presents the unconscious as a natural science homeostatic, physiological, psychological, sociological orderly phenomenon. Findings: FT revamps psychology’s concepts of the unconscious, diagnoses, assessment and morality: It identifies a set of four alternative syndromal ways of resolving conflict as wellness diagnostic categories. It allows measurement of the process utilizing a self-assessment, the Conflict Analysis Battery. This assessment is didactic, diagnostic and therapeutic. The process reconciles religions as normative conflict resolution institutions of psychological origin representing partial and complementary discoveries of the Moral Science. Discussion: Creativity and Power Management is a concise program of emotional education combining a cognitive segment, with the self-assessment using creativity for self-discovery, and a behavior modification moral order promoting segment identifying the principles of conflict resolution: moderation, cooperation and mutual respect as the universal moral values. Education may assist the person to become conscious of the relational unconscious and to learn to manage power to reduce symptom generating consequences. The study departs from identifying it in the Greek cosmogony’s five generations, and its cross-cultural manifestation as alternative resolutions. The study continues reducing the process to two natural science graphically portrayable phenomena as the universal harmonic. The universality of the process is confirmed by observing it in art exhibits and in identifying it in personal samples of creativity as syndromes and relational modalities diagnoses. The usefulness of the process is experienced by completing the self-assessment as a psychoeducational diagnostic and therapeutic program. 1. The creative process reflects the spontaneous unconscious adjustment to the normative environment. The Formal Theory studies the creative process as a circumscribed scientific and moral entity. It has a natural science structure. The unit has a conflict resolution physiological moral function. It is a periodic phenomenon abiding by the laws of two natural science phenomena: the pendulum oscillation and the equilibrial scale. The Unit of Conflict Resolution is an entity that has a beginning, a middle, and an end, the continuity of one key action. Conflict is experienced upon a normative deviation. It is resolved upon a normative conciliation. This is a spontaneous homeostatic mental mechanism leading to a person's social adjustment. This process as a periodic phenomenon has the characteristics of two natural science phenomena: the formal equilibrial operations of the trays of a scale and the physics of the pendulum oscillation, the Simple Harmonic Motion. Unlike the pendulum oscillation that can be in perpetual motion the mental oscillation ends upon the third oscillation. We recognize the conflict resolution process following three oscillations as six role states: Stress response, anxiety, defense, and reversal leading to a compromise. In each oscillation the unconscious mind is guided by one of the three equilibrial operations of the trays of a scale: the mind transforms passivity to activity, antagonism to cooperation and alienation to mutual respect. Upon the third oscillation the conflict is resolved. Conflict is defined formally as a state of passivity, antagonism, and alienation. Resolution is defined formally as mastery, cooperation, and mutual respect. The mental state is transformed from psychic tension, chaos, to rest, order, a conflict is resolved as attitude change, insight and growth. We can portray the process graphically, as a function of time with a sine wave. Its cross-section may be graphically represented as a system of concentric circles. 2. The process is clinically manifesting as a syndrome. We also identify four alternative ways of resolving conflict: the four relational modalities. The Process is a sequence of interrelated emotions and behaviors. We may classify these syndromes according to how an individual resolves conflict. These yeild four key alternative relational modalities which are qualifiable and quantifiable. View the range of Relational Modalities. 3. This phenomenon is measurable. The Unit is an unconscious mechanism reflected in all samples of creativity; therefore tapping one's creative process reveals the personal way of resolving conflict. The Conflict Analysis Battery is a psychological assessment instrument combining a relational inventory with projective techniques, leading to identifying the personal relational modality. This self-assessment is educational, diagnostic, and therapeutic. The Conflict Analysis Battery Taps Creativity to identify one's relational modality and also to reconstruct the personal symbolic patern. The assessment makes us conscious of the unconscious. 4. The conflict resolution process is the Unit moral order. 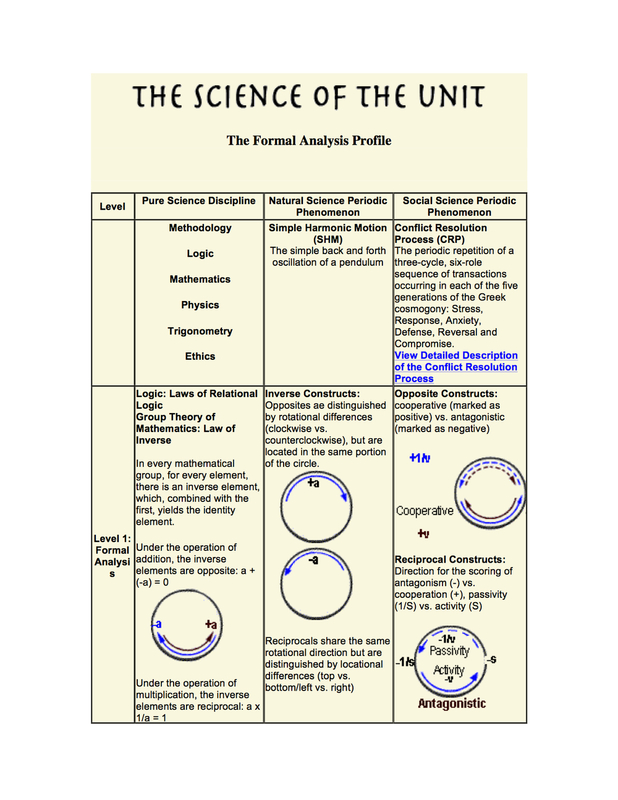 The Unit Process is a scientific moral paradigm. It reflects the calculus of power management, the range of formal interrelated solutions, and also the optimal way of resolving conflict. This paradigm offers the moral injunctions of the optimal way of resolving conflicts. Science respects the contributions of all religions. Science integrates religious moral paradigms as alternative ways of resolving conflict. Religions are normative institutions regulating human conduct. They have evolved improving fairness in family role relations and abstraction in the definition of the divine. The Formal Theory identifies the divine with the abstract conceptualizations of the unconscious process. It promotes insights, enlightenment and wisdom. For comments and statistical analysis of comments check the client reviews under emotional education. Aim: This study explores the effectiveness of the formal theoretical unconscious in integrating psychoanalytic theories into the Science of Conflict Resolution, the Moral Science. Method: FT introduces relational methodology in the place of Freud’s propositional method, observing the creative process as a six-role-state energetic dialectic, resolving conflicts along four relational modalities abiding by laws of the Simple Harmonic Motion and Felix Klein’s formal operations. Findings: The Formal Theory (FT) revamps psychoanalysis by redefining the unconscious as a scientific conflict resolving entity, formalizing psychoanalysis' diverse models and integrating them in a scientific and moral context. 1. It criticizes the Oedipal Complex unconscious as an episode in the context of the conflict resolving play of Oedipus Rex. It introduces the periodicity of a conflict resolution pattern repeated five times in the Greek Cosmogony completed with the creation of the Olympian religion. 2. It interprets Libido and Thanatos as the energetically charged formal dichotomies of the conflict resolution process: antagonism versus cooperation, passivity versus activity, and alienation versus mutual respect. 3. The defense mechanisms are understood as equilibrial formal operations. 4. 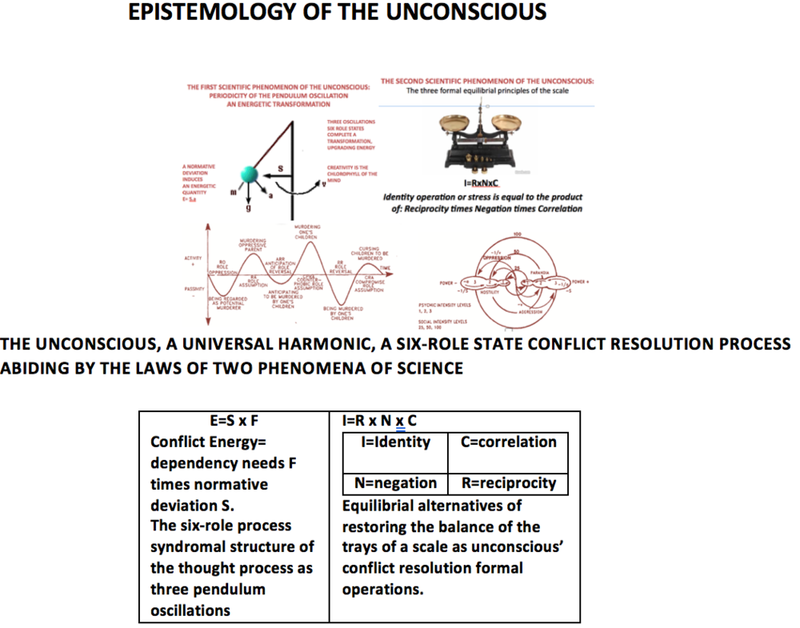 The structural model is revamped as the syndromal conflict-resolution six-role-state energetic transformation. 5. Transference is clarified as four innate relational modalities, a typology of wellness personality diagnoses identifiable with a personality inventory. 6. Freud’s ‘free associations technique’ is modified as a structured creativity based tasks reconstructing Freud’s structural model as a conflict resolution process. 7. Alternative to Freud’s Oedipal-dynamics-Moses, FT introduces the conflict-resolving unconscious as the origin of all religions as complementary discoveries of the science.